Please Note: Access Info – Walk-in only recommended. Drive at your own Risk. 4X4 is Required. The road is impassable to two wheel drive vehicles below the last bench. One can descend but getting back up the hill would be impossible in a two wheel drive vehicle. It is a short walk to the river shore from here. An interesting area on the west bank of the Thompson River, north of Spences Bridge. The park provides access to the river and includes both river and upland habitats. Special Feature: Epsom is one of the few areas along this section of river that provides access for the public to the river. Visitors should bring their own drinking water. Water can be taken from the Thompson River but should be boiled or treated before consuming. Access Info: The bottom third of the road has degraded and is accessible by four wheel drive vehicles with good clearance only. The road is impassable to two wheel drive vehicles below the last bench. One can descend but getting back up the hill would be impossible in a two wheel drive vehicle. It is a short walk to the river shore from here. There are no toilet facilities provided. Visitors should exercise proper backcountry sanitation procedures when no facilities are available. Deposit human waste in cat holes. Cat holes are 6 to 8 inches deep and should be located at least 100 feet from any water source. Thoroughly cover and disguise cat holes when finished. Bury toilet paper as well. Do not burn it. No camping or day-use facilities are provided in this park. 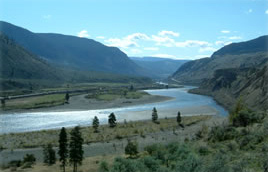 The park is located on the Thompson River approximately 15 km south of the town of Ashcroft. It is accessed off Highway 1. There is road access to within 200 metres of the river, although the final section of road is steep and not suitable for all vehicles. The remaining distance is by foot. The closest communities, towns and cities are Ashcroft, Cache Creek and Kamloops. History: The park was created as a result of recommendations made in the Kamloops Land and Resources Management Plan. It was established July 23, 1997. Cultural Heritage: Reserves belonging to the Nlaka’pamux (“people of the canyon”) First Nations are north of the park and across the river. The river is the site of activities that are very important to the First Nations’ culture. Conservation: The park contains cottonwood, willow and underbrush which provides valuable wildlife habitat. The rivers edge and shallow side channel provide valuable riparian habitat. The park also contains sage/grassland terraces above the river. There are canoeing or kayaking opportunities on the river but visitors need to make themselves aware of the river's gradient before attempting navigation. If launching from the park, the boat must be portaged over the railway tracks. The Thompson River provides opportunity to fish for trout, salmon and steelhead. Anyone fishing or angling in British Columbia must have an appropriate licence. There are no designated trails. Visitors may park by the bench overlooking the river and hike the remainder of the road to the railway tracks to access the river. This road is short in length but quite steep. Hunting is permitted only during lawful game hunting season. Please check the BC Hunting & Trapping Regulations Synopsis for more information. Pets/domestic animals must be on a leash at all times. Backcountry areas are not suitable for dogs or other pets due to wildlife issues and the potential for problems with bears. At low water levels in late July and August, there is a pebble beach area but visitors must use caution in and around the swift flowing river. There are no lifeguards on duty at provincial parks.